In sites of inflammation or tissue injury, hyaluronic acid (HA), ubiquitous in the extracellular matrix, is broken down into low m.w. HA (LMW-HA) fragments that have been reported to activate immunocompetent cells. We found that LMW-HA induces activation of keratinocytes, which respond by producing β-defensin 2. This production is mediated by TLR2 and TLR4 activation and involves a c-Fos-mediated, protein kinase C-dependent signaling pathway. 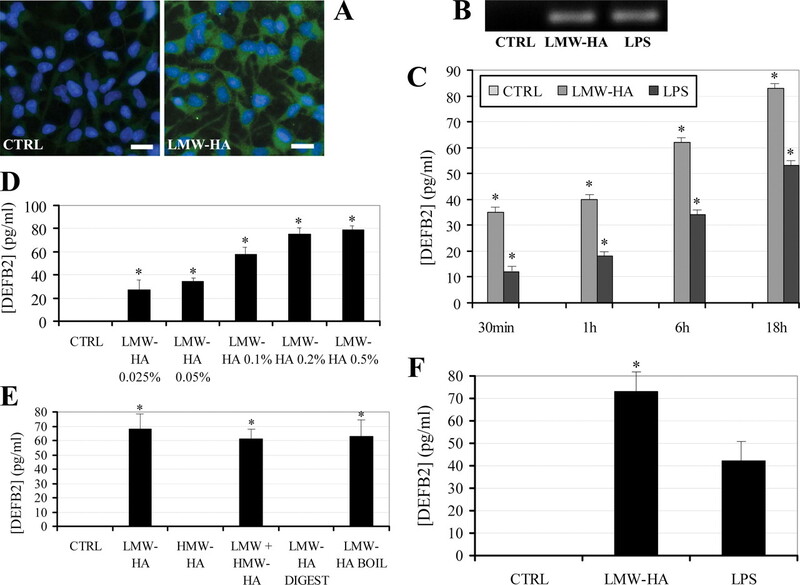 LMW-HA-induced activation of keratinocytes seems not to be accompanied by an inflammatory response, because no production of IL-8, TNF-α, IL-1β, or IL-6 was observed. Ex vivo and in vivo treatments of murine skin with LMW-HA showed a release of mouse β-defensin 2 in all layers of the epidermal compartment. Therefore, the breakdown of extracellular matrix components, for example after injury, stimulates keratinocytes to release β-defensin 2, which protects cutaneous tissue at a time when it is particularly vulnerable to infection. In addition, our observation might be important to open new perspectives in the development of possible topical products containing LMW-HA to improve the release of β-defensins by keratinocytes, thus ameliorating the self-defense of the skin for the protection of cutaneous tissue from infection by microorganisms. The stratum corneum of the skin is the first barrier that pathogenic bacteria have to cross to penetrate into the organism. Keratinocytes of the epidermis not only have an important structural role in forming a physical barrier to foreign Ags and microorganisms, but they also secrete soluble factors with antibacterial activity, i.e., β-defensins (1, 2, 3). The release of β-defensins by keratinocytes may be particularly important in the case of skin lesions when, in the absence of the stratum corneum, microorganisms may reach the connective tissue of the dermis. In this context, the tissue damage may induce degradation of the extracellular matrix with the release of hyaluronic acid (HA)3 fragments. HA is a high m.w. (HMW) glycosaminoglycan, which is ubiquitous in the extracellular matrix; it is involved in maintaining the water balance, in the distribution and transport of plasmatic proteins, and in maintaining an intact matrix structure. In sites of inflammation or tissue injury, HMW-HA may be depolymerized in low m.w. (LMW) fragments through the activity of oxygen radicals or via enzymatic activity by hyaluronidase, β-glucuronidase, and hexosaminidase. In contrast to the HMW form, which is biologically inert regarding its ability to activate immune cells, LMW fragments are able to activate the innate immune defense, promoting the production of different cytokines. Recently, it has been suggested that LMW-HA may trigger TLR2 and TLR4 in immunocompetent cells, stimulating the production of chemokines and cytokines by macrophages (4) and activating dendritic cells and T cells (5, 6). We have recently shown (7) that murine skin expresses proteins belonging to the family of TLRs and that the stimulation of murine skin with their specific ligands, such as LPS, peptidoglycan (PGN), and flagellin, induces production of β-defensin 2 (DEFB2). DEFB2, a peptide produced by different epithelial cells, exerts a strong antimicrobial activity against Gram-negative bacteria and Candida albicans, together with a good bacteriostatic activity against Gram-positive bacteria (8). Chronnell et al. (9) showed that keratinocytes control the proliferation of the microflora that resides in the pilosebaceous unit by the release of DEFB2. 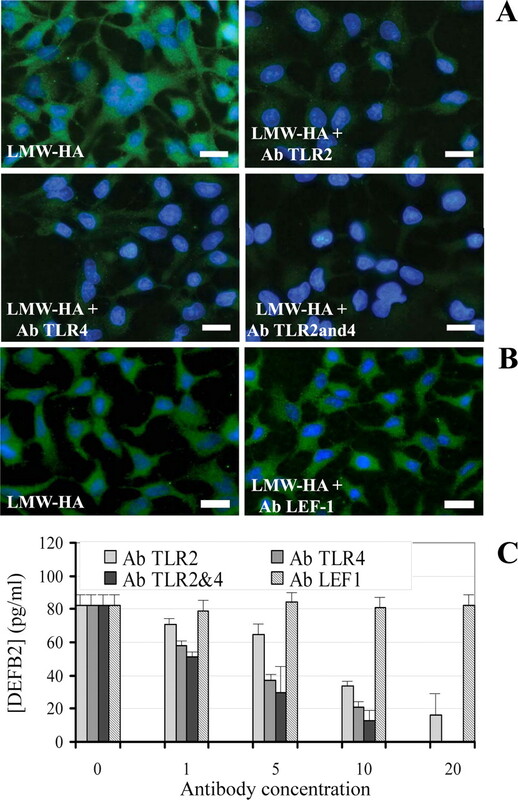 It is possible that LMW-HA, released following skin injury, might stimulate TLR2 and TLR4, inducing DEFB2 production. In the present article we have evaluated the effect of LMW-HA on the production of DEFB2 and the involvement of TLR2 and TLR4 in this production through experiments in vitro using a keratinocyte cell line, ex vivo on murine or human skin samples, and in vivo by the application of LMW-HA on mouse dorsal skin. NCTC 2544 human keratinocytes (American Type Culture Collection (ATCC)) were cultured in DMEM Glutamax with 10% FBS and 10 ml/L penicillin/streptomycin (all from Invitrogen). NHEK (normal human epidermal keratinocyte) primary human keratinocytes (Lonza) were cultured in KGM keratinocyte medium (Lonza) in a serum-free environment. For stimulation experiments on NCTC 2544 cells, the FBS concentration was reduced to 2.5%. For experiments on DEFB2 stimulation, cells were cultured in medium alone or in medium added with LPS from Escherichia coli (5 μg/ml; Sigma-Aldrich) or PGN from E. coli (10 μg/ml, InVivoGen) or in medium containing different concentrations (0.025–0.5%) of LMW-HA sodium salt (Mr < 200 kDa, obtained by biosynthesis; Soliance). LMW-HA concentrations were chosen according to literature (10, 11, 12, 13) and were dependent on the solubility of the sodium salt and on cell viability. Following preliminary dose-response experiments, 0.2% LMW-HA was chosen as standard treatment dosage because this is also a classical concentration of HA that may be found in topical products (14, 15, 16). The absence of endotoxin contamination in the LMW-HA sodium salt was initially assessed by the Limulus amebocyte lysate (LAL) test (Sigma-Aldrich); however, because the LAL assay may be too insensitive to detect small amounts of LPS and does not detect lipoproteins, additional controls included both hyaluronidase (bovine testicular hyaluronidase; Sigma-Aldrich) treatment of LMW-HA (3 h at 37°C with 10 U of hyaluronidase per 50 μl LMW-HA solution) and boiling of the LMW-HA solution to denature possible protein contaminants. Incubation with a solution containing 0.2% HMW-HA sodium salt or 0.2% LMW-HA plus 0.2% HMW-HA sodium salts served as additional controls. All experiments were performed in triplicate. For evaluation of DEFB2 release, media were collected at different time points from 30 min to 18 h after the beginning of treatment. For evaluation of IL-8, TNF-α, IL-1, and IL-6 release in the medium, NCTC 2544 supernatants were collected 18 h after the beginning of treatment. For experiments on TLR blocking, anti-TLR2, anti-TLR4 (Santa Cruz Biotechnology), and anti-LEF-1 (lymphoid enhancer-binding factor-1; Oncogene Research) Abs were used at different concentrations (1–20 μg/ml) during the 18 h of incubation with LPS, PGN or 0.2% LMW-HA. Protein kinase C (PKC) was inhibited with a 5 μM mixture of rottlerin and bisindolylmaleimide (Sigma-Aldrich), the respective inhibitors of PKC-δ and classic PKCs (such as α and β); the concentration used was chosen according to data from the literature. PKC-inhibited cells were treated with HA as reported above and their DEFB2 production was evaluated by PCR analysis and ELISA. All experiments were performed in triplicate. To assess NF-κB involvement in LMW-HA-induced pathway, NCTC 2544 cells were incubated for 18 h in medium containing 0.2% LMW-HA sodium salt in the presence of 5 μM NF-κB inhibitor BAY-7082 (Alexis Biochemicals); at the end of treatment, supernatants were collected and evaluated for their DEFB2 content by ELISA. Biopsies of human dorsal skin have been obtained from patients undergoing routine esthetic dermatosurgery; ethical approval was obtained and patients gave informed consent. Samples of 4 × 4-mm size were obtained and the ipodermis was mechanically removed. The specimens for the ex vivo assay were incubated in medium alone or in a LMW-HA solution at different concentrations (0.025–0.5%) for 3 h; at the end of treatment the supernatants were collected for evaluation of DEFB2 by ELISA while skin specimen were immediately frozen in liquid nitrogen and successively used for the antimicrobial assay. C57BL/6 wild-type mice were from Charles River Laboratories; TLR4-deficient mice were provided by Dr. Besusso, Istituto Nazionale Tumori, Milan, Italy. Experimental protocols were approved by the Ethics Committee for Animal Experimentation of the Istituto Nazionale Tumori, Milan. For studies on DEFB2 production ex vivo, dorsal murine skin fragments (n = 5/group) were incubated with medium alone, with the specific ligands for TLR2 (PGN) and TLR4 (LPS), or with 0.2% LMW-HA. The LMW-HA dosage was chosen according to the previous in vitro experimental data and by referring to the usual HA concentration found in topical products (14, 15, 16). Each specimen was treated for 18 h at 37°C and processed for mRNA extraction. For studies on DEFB2 production in vivo, the dorsal skin of wild-type and TLR4-deficient mice was treated with a mixture of wax and rosin to allow for the complete removal of all hair shafts. On the 8th day after depilation mice (n = 5/group) were treated three times with a cream containing 1% LMW-HA or with vehicle only (100 mg/dose). After 24 h of treatment, dorsal skin samples were collected and processed for mRNA extraction or fixed in 10% neutral buffered formalin and embedded in paraffin. Sections were stained for DEFB2 by immunohistochemistry. Expression of DEFB2 was investigated in NCTC 2544 cells and in murine skin by RT-PCR. Total RNA was isolated and converted into cDNA. PCR was performed using the cMaster PCR enzyme mix (Eppendorf). The PCR cycle for human DEFB2 included denaturation at 94°C for 5 min followed by 35 cycles of denaturation at 94°C for 1 min, annealing at 62°C for 1 min, extension at 72°C for 2 min, and a final extension at 72°C for 10 min. The PCR profile for murine DEFB2 included denaturation at 94°C for 5 min, followed by 35 cycles of denaturation at 94°C for 1 min, annealing at 60°C for 1 min, extension at 72°C for 1 min, and a final extension at 72°C for 10 min. The following primers (Primm) were used: human DEFB2 forward, 5′-TTTGGTGGTATAGGCGATCC-3′; human DEFB2 reverse 5′-GAGGGAGCCCTTTCTGAATC-3′; mouse DEFB2 forward, 5′-GCCATGAGGACTCTCTGCTC-3′; and mouse DEFB2 reverse, 5′-AGGGGTTCTTCTCTGGGAAA-3′. The PCR products were visualized on an ethidium bromide 1% agarose gel. NCTC 2544 keratinocytes were subcultured on cover glasses and fixed in methanol. For TLR2 and TLR4 staining, cells were incubated with the respective primary Abs and secondary Ab donkey anti-goat tetramethylrhodamine isothiocyanate (Molecular Probes). For DEFB2 staining, cells were incubated with swine serum (DakoCytomation), rabbit anti-DEFB2 Ab (Alpha Diagnostic International), and then with goat anti-rabbit FITC Ab (Molecular Probes); nuclei were counterstained with 4′,6′-diamidino-2-phenylindole. Production of human DEFB2 in NCTC 2544 and NHEK cell supernatants or in medium from ex vivo experiments on human skin was quantified using an enzyme immunoassay kit from Phoenix Pharmaceuticals. Concentrations of IL-8, TNF-α, IL-1β, and IL-6 in NCTC 2544 supernatants were evaluated using ELISA kits obtained from GE Healthcare (IL-8), Endogen (TNF-α), and MedSystem Diagnostic (both IL-1β and IL-6) and conducted according to the manufacturers’ instructions. NF-κB and c-Fos nuclear expressions were evaluated in proteins extracted from treated and untreated NCTC 2544 cells using a nuclear/cytosol fractionation kit (MBL International). Nuclear proteins (15 μg) were fractionated on a 8% acrylamide slab gel containing 0.1% SDS and transferred onto a nitrocellulose filter by electroblotting. For detection of NF-κB, the filter with nuclear extracts was incubated with mouse Ab to NF-κB p65 (catalog no. sc-8008, Santa Cruz Biotechnology), whereas for detection of the c-Fos signal the filter was incubated with rabbit anti-c-Fos Ab (catalog no. sc-253, Santa Cruz Biotechnology). Total cellular extract was used for evaluation of IkB expression using a rabbit anti-IkB Ab (catalog no. ab32518, Abcam). To normalize protein expression of different samples, β-actin protein expression was used as a reference loading control for total cellular extracts by the use of a mouse anti-β-actin Ab (catalog no. AC-15, Abcam), while lamin B protein expression served as nuclear protein control using a goat anti-lamin B Ab (catalog no. sc-6216, Santa Cruz Biotechnology). ChIP assay was performed on NCTC 2544 cells treated for 18 h with 0.2% LMW-HA or left untreated to confirm the involvement of c-Fos in the LMW-HA-induced DEFB2 expression. Briefly, 10,000 cells/sample were cross-linked with 1% formaldehyde for 10 min, lysed, and sonicated using a Fisher Scientific 550 sonic dismembrator. An aliquot of the sonicated cells was amplified as input control. Sonicated cells were immunoprecipitated with specific Ab to human c-Fos (catalog no. sc-8047, Santa Cruz Biotechnology). After reversing the cross-linking, PCR was performed with the following primers that amplify part of the DEFB2 promoter: 5′-GAGGAATTTTCTGGTCCCAAG-3′ (forward) and 5′-CCATGAGGGTCTTGTATCTCCTC-3′ (reverse). The PCR cycle included denaturation at 95°C for 5 min followed by 40 cycles of denaturation at 95°C for 1 min, annealing at 60°C for 1 min, extension at 72°C for 1 min 30 s, and a final extension at 72°C for 10 min. The PCR products were visualized on an ethidium bromide agarose gel and normalized to input control. We used an immunohistochemical technique to localize DEFB2 protein in sections of vehicle- and LMW-HA cream-treated mouse skin samples. Paraffin sections of 4-μm thickness were placed on silanized slides, deparaffinized, and rehydrated. After Ag retrieval by enzymatic treatment with a 0.5% trypsin solution for 20 min at 37°C, the quenching of endogenous peroxidases was performed in 0.3% H2O2 in PBS for 30 min at room temperature. To avoid nonspecific binding, the slides were blocked with rabbit serum diluted 1/50 in PBS/BSA 1% for 30 min at room temperature. Mouse skin sections were then incubated with goat anti-DEFB2 Ab (1/100 in PBS; catalog no. sc-10858 from Santa Cruz Biotechnology) for 1 h at room temperature, rinsed in PBS, and incubated with rabbit anti-goat secondary Ab (1/100 in PBS) for 1 h at room temperature. After incubation with goat peroxidase-antiperoxidase (1/100 in PBS) for 1 h at room temperature, the staining was revealed using diaminobenzidine. Then mouse skin samples were washed, dehydrated through an ascending series of ethanols, and mounted with Entellan. The same immunohistochemical analysis was performed on vehicle and LMW-HA cream-treated TLR4−/− mice skin samples. Biopsies of human dorsal skin treated with LMW-HA or medium alone and frozen in liquid nitrogen were pulverized with a pestle in liquid nitrogen and proteins were extracted under gentle agitation for 2 h in 5% acetic acid with the addition of protease inhibitors (0.02 mM PMSF, 2 ng/ml pepstatin, and 2 ng/ml leupeptin). The soluble proteins in the supernatant were dried under vacuum and resuspended in 0.01% acetic acid. Protein concentrations were determined by bicinchoninic assay (BCA; Pierce Biotechnology). For examination of the activity of antimicrobial peptides produced by skin biopsies, we first incubated 104 bacteria/ml (OD600) of mid-logarithmic-phase E. coli ATCC 4157 (International PBI) in phosphate buffer (pH 7.4) in a final volume of 100 μl. The E. coli suspension was mixed with 30 μg of the skin protein extracts or with 10 μg of DEFB2 recombinant peptide (positive control) (Millipore) or with 10 μl of 0.01% acetic acid and protease inhibitor mixture (negative control) and incubated at 37°C for 120 min. At the end of the incubation, 10 μl of these bacteria suspensions and of 1/10 and 1/100 dilutions were plated in triplicate in petri dishes containing tryptic soy broth (International PBI) and incubated overnight at 37°C. At the end of incubation, the number of CFU for each sample was determined. The human keratinocyte NCTC 2544 cell line was found to express TLR2 and TLR4 proteins (Fig. 1⇓A), as previously observed on other keratinocyte cell lines and primary keratinocytes (17, 18). An intense production of DEFB2, assessed by PCR and immunofluorescence analysis, was observed when cells were stimulated with the TLR2- and TLR4-specific bacterial ligands PGN and LPS, respectively, for 18 h (Fig. 1⇓B). TLR and DEFB2 expression in human keratinocytes. A, Cells were analyzed by immunofluorescence analysis for TLR2 and TLR4 expression (CTRL, negative control by omission of primary antibody). B, Following treatment with PGN or LPS, cells were analyzed for their DEFB2 expression in comparison with untreated cells (CTRL). Bars, 10 μm. To evaluate whether LMW-HA might be able to induce expression of DEFB2 in keratinocytes, NCTC 2544 cells were incubated for 18 h with a medium containing 0.025–0.5% LMW-HA; LPS-treated cells were used as positive control (19). Cells treated with 0.2% of LMW-HA showed a marked production of DEFB2 as revealed by immunofluorescence and PCR analysis (Fig. 2⇓, A and B). Quantification of DEFB2 secretion at different time points of treatment (30 min, 1 h, 6 h, and 18 h) and with different LMW-HA concentrations (0.025–0.5%), assessed by ELISA, showed that the levels of secreted DEFB2 significantly increased with a progressive accumulation of the peptide in the culture medium over time (p < 0.005 vs control) and depending on the concentration of LMW-HA in the culture medium (Fig. 2⇓, C and D). Additional experiments assessed DEFB2 production following incubation of NCTC 2544 with a 0.2% HMW-HA solution or a 0.2% LMW-HA plus 0.2% HMW-HA solution. ELISA showed that HMW-HA was unable to induce DEFB2 production, while the presence of HMW-HA does not inhibit the activity of LMW-HA (Fig. 2⇓E). LMW-HA-induced DEFB2 expression in human keratinocytes. A–D, Secretion of DEFB2 by NCTC 2544 human keratinocytes following treatment with LMW-HA has been shown by immunofluorescence (A; with 0.2% LMW-HA solution; bars, 10 μm. ), PCR (B; with 0.2% LMW-HA solution), and ELISA on cells supernatants at different time points after the beginning of treatment (C; with 0.2% LMW-HA solution) and with different LMW-HA concentrations (D). E, Additional experiments assessed the production of DEFB2 following treatment with HMW-HA or after digestion or boiling of the 0.2% LMW-HA solution. F, Secretion of DEFB2 by NHEK primary keratinocytes following treatment with 0.2% LMW-HA was additionally analyzed. LPS was used as positive control. ∗, p < 0.005 vs control (CTRL). Additional in vitro experiments demonstrated that the observed DEFB2 production was not due to the presence of LPS or lipoproteins contaminants, because digestion of our LMW-HA solution with hyaluronidase resulted in complete loss of induction of DEFB2, whereas boiling the same solution to denature possible protein contaminants did not affect activity of LMW-HA, as shown by ELISA (Fig. 2⇑E). We then treated NHEK primary keratinocytes for 18 h with 0.2% LMW-HA or with medium alone and evaluated their DEFB2 production by ELISA; our results confirmed the data previously obtained on the keratinocyte cell line, because LMW-HA increased DEFB2 production by NHEK with respect to control cells (Fig. 2⇑F) (p < 0.005 vs control). Trying to understand whether the observed DEFB2 production following LMW-HA treatment had to be ascribed to the stimulation of TLR2 and TLR4, cells were incubated for 18 h with 0.2% LMW-HA and an Ab for TLR2 and/or TLR4 blocking. Keratinocytes incubated with PGN or LPS and the relative specific anti-TLR Abs served as control. Cells were analyzed by immunofluorescence analysis for their DEFB2 production; in cells incubated with one of the TLR-blocking Abs (20 μg/ml), the HA-induced DEFB2 production was substantially diminished in comparison to that of cells treated with HA alone (Fig. 3⇓A). Keratinocytes incubated with HA and both Abs, anti-TLR2 and anti-TLR4, showed an almost complete inhibition of DEFB2 production (Fig. 3⇓A). An unrelated anti-LEF-1 Ab (20 μg/ml) showed no interference in the LMW-HA-induced DEFB2 production (Fig. 3⇓B). Immunofluorescence results were confirmed via ELISA by the dosage of DEFB2 peptide released into the cell medium using different concentrations of TLR-blocking Abs (1–20 μg/ml), which showed progressive inhibition of the TLR-driven DEFB2 production depending on the concentrations of the blocking Abs (Fig. 3⇓C). Involvement of TLR2 and TLR4 in HA-induced DEFB2 production. A, Blocking of TLR2 and TLR4 by specific Abs inhibited the LMW-HA-induced DEFB2 production as shown by immunofluorescence analysis. B, An unrelated anti-LEF-1 Ab served as control. Bars, 10 μm. C, ELISA performed on cell supernatants with different Ab concentrations confirmed the results previously obtained by immunolocalization. To assess whether HA induces the release of other molecules of innate immune response and proinflammatory mediators, we evaluated IL-8, TNF-α, IL-1β, and IL-6 production in treated keratinocytes. ELISA test revealed that the levels of these molecules in HA-treated cells were comparable to basal production after 18 h of treatment (Fig. 4⇓). LPS-treated cells served as positive control (20, 21). Activity of LMW-HA on proinflammatory mediators. ELISA on cell supernatants revealed no production of IL-8 (A), TNF-α (B), IL-1β (C), and IL-6 (D) by 0.2% LMW-HA-treated keratinocytes. CTRL, Control. After assessment of DEFB2 production by human keratinocytes following LMW-HA treatment, we evaluated the production of the same antimicrobial peptide in an ex vivo model of human skin. Skin biopsies were treated in vitro for 3 h with a 0.2% hyaluronan solution or with LPS used as positive control for DEFB2 production (19). An ELISA on human skin supernatants (Fig. 5⇓A) revealed an intense DEFB2 production in samples treated with 0.2% LMW-HA, while untreated samples resulted negatively for DEFB2 production (p < 0.05 vs control). Ex vivo and in vivo activity of LMW-HA. 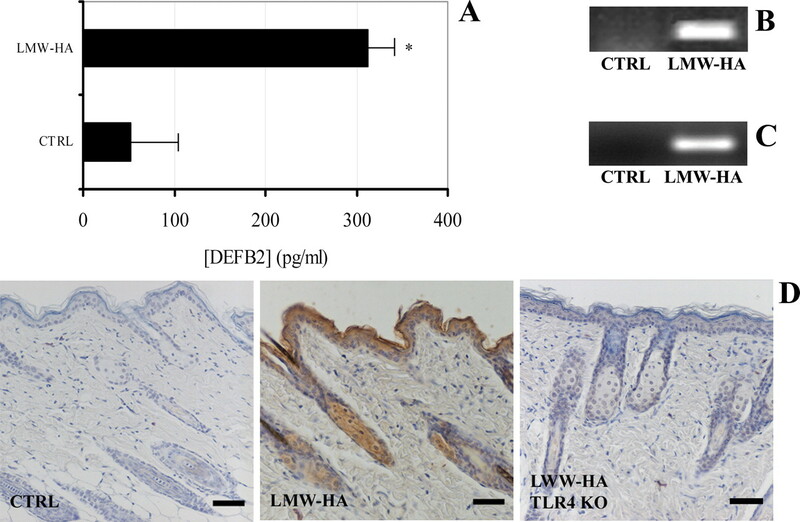 A, Ex vivo experiments performed on human skin samples revealed an intense secretion of human DEFB2 in the supernatant following LMW-HA treatment as shown by ELISA (∗, p < 0.05 vs CTRL). B, Murine skin samples treated with 0.2% LMW-HA in vitro showed induction of murine DEFB2 transcription by PCR analysis. C and D, The same DEFB2 stimulation was observed following in vivo treatment of murine skin with a formulation containing LMW-HA as assessed by PCR (C) and immunohistochemistry on wild-type mice, while TLR4-deficient animals showed a massive reduction of DEFB2 induction (D). Bars, 20 μm. CTRL, Control; KO, knockout. After our assessments on the ability of LMW-HA to induce DEFB2 production in human keratinocyte cell cultures and in human skin biopsies ex vivo, we thought it was important to develop an in vivo model also to assess whether our findings obtained in very simplified models might be transposable to a more complex system such as an in vivo model; in fact, this would allow us to think about a possible use of LMW-HA for the stimulation of skin innate immunity and to test whether the administration of LMW-HA by topical route might be as efficacious as using it in the previously tested culture medium. For this aim, the use of an animal model was essential; in any case, in mouse the ortholog of human DEFB2 does not exist. Thus, we have decided to analyze the production of murine mDEFB2 because, analogously to human hDEFB2, mDEFB2 is the mostly inducible peptide in the family of murine β-defensins (22, 23). We started our assays on the murine model by developing an ex vivo experiment on mouse skin to assess whether LMW-HA had an analogous DEFB2-increasing effect on the murine mDEFB2 peptide; Fig. 5⇑B shows by PCR analysis that LMW-HA induces a marked increase in mDEFB2 transcription, analogously to the previously observed effects on human samples. Following the evaluation of DEFB2 production by hyaluronan-treated skin ex vivo, we evaluated the effects of in vivo treatment of mice with a cream formulation containing 1% of the previously tested LMW-HA. Following depilation of dorsal skin, mice (n = 5/group) were treated three times in 1 day with the cream containing LMW-HA or with vehicle cream only (100 mg/dose). After 24 h of treatment, dorsal skin samples were collected and DEFB2 production by cutaneous compartment was evaluated by both PCR analysis and immunohistochemistry. PCR analysis showed an intense transcription of the DEFB2 gene in hyaluronan cream-treated animals (Fig. 5⇑C); immunohistochemistry showed that the antimicrobial peptide is present in all of the layers of the epidermal compartment (Fig. 5⇑D). The same experiment performed on TLR4-deficient mice showed a massive reduction of DEFB2 induction by LMW-HA (Fig. 5⇑D). Given the observed increase in DEFB2 production induced by LMW-HA treatment in both keratinocytes and human or murine skin, we aimed to evaluate the antimicrobial activity in protein extracts of skin biopsies treated with different concentrations (0.025–0.5%) of LMW-HA. Therefore, we prepared protein extracts from LMW-HA-treated and untreated human skin biopsies and tested the antibacterial activity of these extracts against E. coli ATCC 4157, a bacterial strain that is reported to be sensitive to DEFB2 (24). We evaluated the number of CFU in the different samples (n = 5/treatment) after overnight incubation of bacteria previously mixed with the protein extracts; as shown by Table I⇓, the extract from untreated skin induces a slight inhibition of bacterial CFU formation, whereas the skin treated with increasing concentrations of LMW-HA exerts a progressively higher antimicrobial activity with respect to control untreated skin. We analyzed the pathway of DEFB2 production following TLRs activation by LMW-HA because TLRs activation may induce different intracellular signaling cascades. First of all, we further investigated the involvement of the TLR pathway by analyzing the contribution of PKC, a molecule known to be involved in the TLR pathway (25), in the observed DEFB2 production. We used rottlerin and bisindolylmaleimide, two specific inhibitors of PKC δ, α, and β (26); the DEFB2 production of inhibited cells following LMW-HA treatment was significantly lower than the one of uninhibited cells (p < 0.005 LMW-HA vs LMW-HA plus PKC inhibitors) as shown by both PCR analysis and ELISA (Fig. 6⇓, A and B). Analysis of the signaling pathway activated by LMW-HA treatment. A and B, Inhibition of PKC reduced DEFB2 production following LMW-HA treatment of keratinocytes as assessed by PCR analysis (A) and ELISA (B) (∗, p < 0.005 LMW-HA vs LMW-HA plus PKC inhibitors). C, Western blot analysis showed an increase of nuclear translocation of c-Fos following LMW-HA-treatment, whereas no difference has been noted regarding NF-κB and IkB with respect to control (CTRL) cells; β-actin expression (for total cellular extracts) and lamin B expression (for nuclear extracts) were used as loading controls. D, Treatment of keratinocytes with LMW-HA and the NF-κB inhibitor BAY-7082 showed no inhibition of DEFB2 production. E, In addition, ChIP analysis showed a stronger c-Fos binding to the DEFB2 promoter region in the LMW-HA-treated keratinocytes than in untreated (CTRL) cells. Among the transcription factors activated by TLR2 and 4, NF-κB is certainly one of the most frequently involved. Therefore, we aimed to determine whether this transcription factor was responsible for the LMW-HA-induced DEFB2 expression; hence, we determined by Western blot analysis the presence of the NF-κB p65 protein in the nuclear compartment of HA-treated cells, which indicates its activation by translocation from the cytosol to the nucleus. As shown in Fig. 6⇑C, after 18 h of LMW-HA treatment nuclear NF-κB protein expression was comparable to basal levels, indicating a complete absence of NF-κB activation; this result suggests that NF-κB seems not to be involved in the observed DEFB2 production. Because inactivated NF-κB dimers are sequestered in the cytosol of cells via noncovalent interactions with a class of inhibitor proteins called IkBs, the absence of NF-κB involvement in this pathway was confirmed by Western blot analysis for IkB in the total protein extract; no alterations in the expression of this protein was found in HA-treated cells compared with untreated cells (Fig. 6⇑C). LPS-treated cells served as a positive control (27). Additional experiments to exclude the involvement of NF-κB were performed. Keratinocytes were cultured with 0.2% LMW-HA as previously described in presence of BAY-7082, an inhibitor of NF-κB. ELISA for DEFB2 on the collected supernatants showed a production of the antimicrobial peptide that is comparable to the one obtained without the NF-κB inhibitor (Fig. 6⇑D). Because genomic analysis of DEFB2 revealed a promoter region containing several putative transcription factor binding sites, including AP-1 (28), we evaluated the nuclear translocation of c-Fos, one of the members of the AP-1 dimer. Western blot analysis showed that after 18 h of treatment keratinocytes present a marked increase in c-Fos nuclear expression, which might indicate its involvement in the HA-driven DEFB2 production (Fig. 6⇑C). In addition, given the supposed involvement of c-Fos observed by Western blot analysis, we chose to determine whether c-Fos binds to and potentially regulates the DEFB2 promoter in vitro. Therefore, keratinocytes were cultured with 0.2% LMW-HA or medium alone, as previously described. ChIP was then performed with an Ab specific to c-Fos to examine binding to the DEFB2 promoter in human keratinocytes. The DEFB2 binding region was successfully amplified from our cells, with notably stronger c-Fos binding in the LMW-HA-treated keratinocytes than in untreated cells (Fig. 6⇑E). These data show that c-Fos is the transcription factor involved in the increase of DEFB2 production following LMW-HA treatment of keratinocytes. Our data show that LMW-HA is an efficient inducer of DEFB2 production; this finding, observed in a keratinocyte cell line, has been confirmed by experiments in primary keratinocytes and in ex vivo and in vivo samples of both murine and human skin. Because, in the event of skin injury, the degradation of the extracellular matrix releases LMW-HA fragments in the dermis (29), our data might explain the intense presence of DEFB2 peptide observed by Schmidt et al. (30) and Butmarc et al. (31) after injury to skin, even in the absence of infection. These studies on the increase of human β-defensin 2 expression in wound healing are further supported by studies made by Sørensen et al. (32, 33), who found that the growth factors important in wound healing, insulin-like growth factor I and TGF-α, induce the expression of several antimicrobial peptides/polypeptides in human keratinocytes such as human cationic antimicrobial protein hCAP-18/LL-37, human β-defensin 3, neutrophil-gelatinase-associated lipocalin, and secretory leukocyte protease inhibitor, defining a host defense role for growth factors in wound healing. Thus, in the case of skin injury, both extracellular matrix components and growth factors may contribute to the production of an array of protective antimicrobial peptides. Microbial CFU assay showed a progressive inhibitory activity of extracts from skin treated with increasing concentrations of LMW-HA and it is plausible that DEFB2 greatly contributed to this antimicrobial activity, although other antimicrobial peptides can be produced by the skin (34). The stimulation of defensin expression in sites of skin injury may decrease the possible bacterial contamination by pathogens and may even facilitate tissue repair by providing innate immunity through the chemotactic activity of these antimicrobial peptides (35). 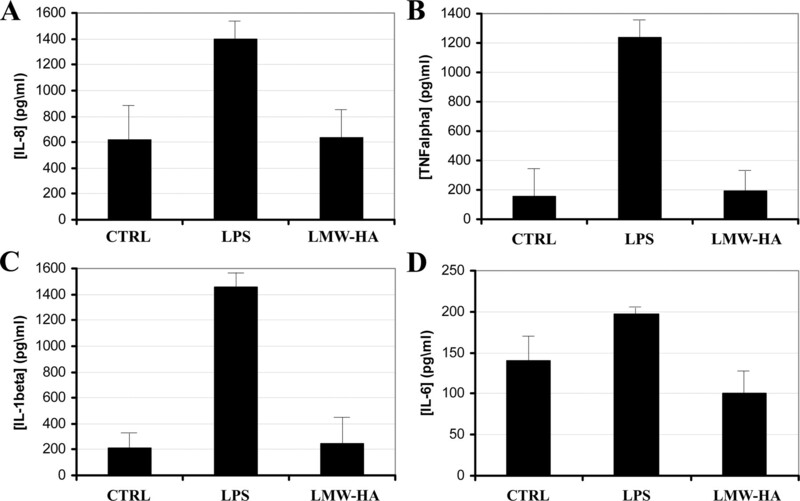 Blocking experiments using Abs against TLR2 and TLR4 clearly show that LMW-HA-induced DEFB2 production involves the activation of these two receptors. Although other surface-expressed receptors, such as CD44 and S1P receptors, are reported to bind LMW-HA, the results of our experiments with specific blocking Abs have excluded their involvement in this signaling because they completely blocked LMW-HA-induced DEFB2 production. TLRs, in addition to the recognition of conserved microbial products that signal the presence of an infection, have been found to detect endogenous ligands that signal danger conditions such as degradation products of macromolecules and products of proteolytic cascades (35). The previously reported (5, 6) ligand activity of LMW-HA on TLR2 and TLR4 may be linked to the structure of HA, which consists of a repeating disaccharide with features of “pathogen-associated molecular patterns” (29). Because HA is usually present in the dermis in the form of a HMW polymer, the presence of important amounts of LMW fragments due to a tissue injury is perceived by the epithelial compartment as a danger signal for the organism (36), which responds with DEFB2 release to fight an eventual microorganism invasion. It is noteworthy that proinflammatory mediators and chemokines such as TNF-α, IL-1β, IL-6, and IL-8, which frequently are produced following TLR activation, were not detected in the supernatants of LMW-HA-activated keratinocytes (37). Accordingly, Uehara et al. (38) observed in different epithelial cell lines that the stimulation of TLRs with synthetic ligands induced DEFB2 expression without concomitant IL-6, IL-8, and MCP-1 secretion. It has also been reported that DEFB2 mRNA expression in gingival epithelial cells and tissue, induced by several natural stimuli, is regulated differently from that of IL-8 (39). The TLR signaling pathway may activate a variety of transcription factors, including NF-κB (p50/p65) and AP-1 (c-Fos/c-Jun), that lead to the activation of different genes. Previous genomic analysis of human DEFB2 revealed a promoter region containing several putative transcription factor binding sites, including AP-1 (40). Moreover, cloning of the human DEFB2 gene has revealed that it is unique among defensin genes, having three binding sites for the transcription factor NF-κB (41). Western blot analysis of nuclear extracts showed a marked increase of c-Fos but not NF-κB nuclear translocation in cells treated with LMW-HA. Additional experiments confirmed that the use of an inhibitor of NF-κB did not interfere with LMW-HA-induced DEFB2 production; moreover, ChIP analysis demonstrated the ability of c-Fos to link the DEFB2 promoter of keratinocytes following LMW-HA treatment. Therefore, our data implicate a role for the AP-1 transcription factor family in DEFB2 regulation in response to LMW-HA treatment of keratinocytes and suggest that members of the NF-κB transcription factor family are not required for DEFB2 regulation. Clearly, this does not exclude the possibility that NF-κB may be involved in DEFB2 regulation in other epithelial cell lines or in the presence of other stimulants. Our immunohistochemistry experiments on murine LMW-HA-treated skin also showed mDEFB2 expression in hair follicles, indicating that the administration of exogenous LMW-HA by topical application is able to stimulate not only the easily accessible epidermis keratinocytes but also the less reachable hair canals. The induction of DEFB2 in the infundibulum and the sebaceous duct of the hair follicle, which represent frequent ways of access for invading microorganisms, suggests a possible use of HA for topical application as an antimicrobial peptide stimulator in controlled microbial-related hair pathologies. To our knowledge, this is the first time that LMW-HA has been proposed as active topical agent. In conclusion, although the skin immune defense has been classically ascribed only to the immune cells, which reside in a matrix typically considered inert, our data show that the matrix itself, through the activity of its components’ breakdown products, may actively stimulate the production of DEFB2 by the overlying epidermis. Our data, which indicate a production of DEFB2 following LMW-HA treatment, may clarify a physiological mechanism that is probably present in the skin in the presence of endogenous danger signals to avoid an eventual bacterial infection, although this assessment of ours is certainly only speculative at the moment, based on data of the literature. In addition, the observation that the topical application of LMW-HA on the skin is able to induce an antibacterial response suggests the possible use of this natural molecule as a physiological stimulator of cutaneous antibacterial activity. ↵1 S.G. and M.P. contributed equally to this work. ↵3 Abbreviations used in this paper: HA, hyaluronic acid; ChIP, chromatin immunoprecipitation; DEFB2, β-defensin 2; HMW, high m.w. ; LEF-1, lymphoid enhancer-binding factor-1; LMW, low m.w. ; NHEK, normal human epidermal keratinocyte; PGN, peptidoglycan; PKC, protein-kinase C.
Kanda, N., S. Watanabe. 2007. Histamine enhances the production of human β-defensin-2 in human keratinocytes. Am. J. Physiol. 293: C1916-C1923. Braff, M. H., R. L. Gallo. 2006. Antimicrobial peptides: an essential component of the skin defensive barrier. Curr. Top. Microbiol. Immnunol. 306: 91-110. Donnarumma, G., I. Paoletti, E. Buommino, M. Orlando, M. A. Tufano, A. Baroni. 2004. Malassezia furfur induces the expression of β-defensin-2 in human keratinocytes in a protein kinase C-dependent manner. Arch. Dermatol. Res. 295: 474-481. Jiang, D., J. Liang, J. Fan, S. Yu, S. Chen, Y. Luo, G. D. Prestwich, M. M. Mascarenhas, H. G. Garg, D. A. Quinn, et al 2005. Regulation of lung injury and repair by Toll-like receptors and hyaluronan. Nat. Med. 11: 1173-1179. Scheibner, K. A., M. A. Lutz, S. Boodoo, M. J. Fenton, J. D. Powell, M. R. Horton. 2006. Hyaluronan fragments act as an endogenous danger signal by engaging TLR2. J. Immunol. 177: 1272-1281. Selleri, S., F. Arnaboldi, M. Palazzo, S. Gariboldi, L. Zanobbio, E. Opizzi, Y. F. Shirai, A. Balsari, C. Rumio. 2007. Toll-like receptor agonists regulate β-defensin 2 release in hair follicle. Br. J. Dermatol. 156: 1172-1177. Schroder, J. M., J. Harder. 1999. Human β-defensin 2. Int. J. Biochem. Cell Biol. 31: 645-651. Chronnell, C. M., L. R. Ghali, R. S. Ali, A. G. Quinn, D. B. Holland, J. J. Bull, W. J. Cunliffe, I. A. McKay, M. P. Philpott, S. Muller-Rover. 2001. Human β defensin-1 and -2 expression in human pilosebaceous units: upregulation in acne vulgaris lesions. J. Invest. Dermatol. 117: 1120-1125. Sikkink, C. J., M. M. Reijnen, P. Falk, H. van Goor, L. Holmdahl. 2005. Influence of monocyte-like cells on the fibrinolytic activity of peritoneal mesothelial cells and the effect of sodium hyaluronate. Fertil. Steril. 84: (Suppl. 2):1072-1077. Zou, L., X. Zou, L. Chen, H. Li, T. Mygind, M. Kassem, C. Bünger. 2007. Effect of hyaluronan on osteogenic differentiation of porcine bone marrow stromal cells in vitro. J. Orthop. Res. 26: 713-720. Rosines, E., H. J. Schmidt, S. K. Nigam. 2007. The effect of hyaluronic acid size and concentration on branching morphogenesis and tubule differentiation in developing kidney culture systems: potential applications to engineering of renal tissues. Biomaterials 28: 4806-4817. Trabucchi, E., S. Pallotta, M. Morini, F. Corsi, R. Franceschini, A. Casiraghi, A. Pravettoni, D. Foschi, P. Minghetti. 2002. Low molecular weight hyaluronic acid prevents oxygen free radical damage to granulation tissue during wound healing. Int. J. Tissue React. 24: 65-71. Lee, J. H., J. Y. Jung, D. Bang. 2007. The efficacy of topical 0.2% hyaluronic acid gel on recurrent oral ulcers: comparison between recurrent aphthous ulcers and the oral ulcers of Behçet’s disease. J. Eur. Acad. Dermatol. Venereol. 22: 590-595. Nolan, A., C. Baillie, J. Badminton, M. Rudralingham, R. A. Seymour. 2006. The efficacy of topical hyaluronic acid in the management of recurrent aphthous ulceration. J. Oral. Pathol. Med. 35: 461-465. Pivarcsi, A., A. Koreck, L. Bodai, M. Szell, C. Szeg, N. Belso, A. Kenderessy-Szabo, Z. Bata-Csorgo, A. Dobozy. 2004. Differentiation-regulated expression of Toll-like receptors 2 and 4 in HaCaT keratinocytes. Arch. Dermatol. Res. 296: 120-124. Lebre, M. C., A. M. van der Aar, L. van Baarsen, T. M. van Capel, J. H. Schuitemaker, M. L. Kapsenberg, E. C. de Jong. 2007. Human keratinocytes express functional Toll-like receptor 3, 4, 5 and 9. J. Invest. Dermatol. 127: 331-341. Chadebech, P., D. Goidin, C. Jacquet, J. Viac, D. Schmitt, M. J. Staquet. 2003. Use of human reconstructed epidermis to analyze the regulation of β-defensin hBD-1, hBD-2, and hBD-3 expression in response to LPS. Cell Biol. Toxicol. 19: 313-324. Kis, K., L. Bodai, H. Polyanka, K. Eder, A. Pivarcsi, E. Duda, G. Soos, Z. Bata-Csorgo, L. Kemeny. 2006. Budesonide, but not tacrolimus, affects the immune functions of normal human keratinocytes. Int. Immunopharmacol. 6: 358-368. Ballanger, F., I. Tenaud, C. Volteau, A. Khammari, B. Dréno. 2008. Anti-inflammatory effects of lithium gluconate on keratinocytes: a possible explanation for efficiency in seborrhoeic dermatitis. Arch. Dermatol. Res. 300: 215-223. Morrison, G. M., D. J. Davidson, J. R. Dorin. 1999. A novel mouse β defensin, Defb 2, which is upregulated in the airways by lipopolysaccharide. FEBS Lett. 442: 112-116. Ikeda, A., Y. Nakanishi, T. Sakimoto, J. Shoji, M. Sawa, N. Nemoto. 2006. Expression of β defensins in ocular surface tissue of experimentally developed allergic conjunctivitis mouse model. Jpn. J. Ophthalmol. 50: 1-6. Kim, D. C., S. H. Kim, M. W. Jeong, N. I. Baek, K. I. Kim. 2005. 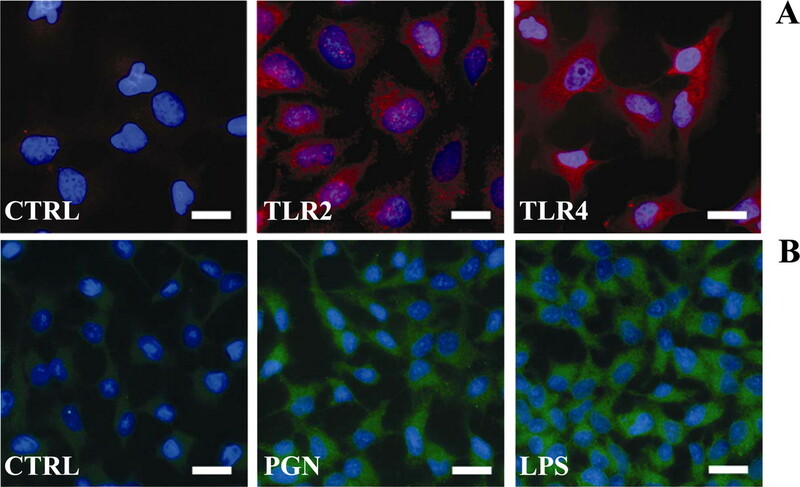 Effect of rottlerin, a PKC δ inhibitor, on TLR-4 dependent activation of murine microglia. Biochem. Biophys. Res. Commun. 337: 110-115. Aksoy, E., M. Goldman, F. Willems. 2004. Proteine kinase C ε: a new target to control inflammation and immune-mediated disorders. Int. J. Biochem. Cell Biol. 36: 183-188. Raghav, S. K., B. Gupta, A. Shrivastava, H. R. Das. 2007. Inhibition of lipopolysaccharide-inducible nitric oxide synthase and IL-1β through suppression of NF-κB activation by 3-(1′-1′-dimethyl-allyl)-6-hydroxy-7-methoxy-coumarin isolated from Ruta graveolens L. Eur. J. Pharmacol. 560: 69-80. Lu, Z., K. Kim, M. A. Suico, T. Shuto, J. Li, H. Kai. 2004. MEF up-regulates human β-defensin 2 expression in epithelial cells. FEBS Lett. 561: 117-121. Jiang, D., J. Liang, P. W. Noble. 2007. Hyaluronan in tissue and repair. Annu. Rev. Cell. Dev. Biol. 23: 435-461. Schmid, P., O. Grenet, J. Medina, S. D. Chibout, C. Osborne, D. A. Cox. 2001. An intrinsic antibiotic mechanism in wounds and tissue engineered skin. J. Invest. Dermatol. 116: 471-472. Butmarc, J., T. Yufit, P. Carson, V. Falanga. 2004. Human β-defensin-2 expression is increased in chronic wounds. Wound Repair Regen. 12: 439-443. Sørensen, O. E., J. B. Cowland, K. Theilgaard-Mönch, L. Liu, T. Ganz, N. Borregaard. 2003. Wound healing and expression of antimicrobial peptides/polypeptides in human keratinocytes, a consequence of common growth factors. J. Immunol. 170: 5583-5589. Sørensen, O. E., D. R. Thapa, K. M. Roupé, E. V. Valore, U. Sjöbring, A. A. Roberts, A. Schmidtchen, T. Ganz. 2006. Injury-induced innate immune response in human skin mediated by transactivation of the epidermal growth factor receptor. J. Clin. Invest. 116: 1878-1885. Namjoshi, S., R. Caccetta, H. A. Benson. 2007. Skin peptides: biological activity and therapeutic opportunities. J. Pharm. Sci. 97: 2524-2542. Goodarzi, H., J. Trowbridge, R. L. Gallo. 2007. Innate immunity: a cutaneous perspective. Clin. Rev. Allergy Immunol. 33: 15-26. Matzinger, P.. 2004. The danger model: a renewed sense of self. Science 296: 301-305. Hajishengallis, G., H. Sojar, R. J. Genco, E. DeNardin. 2004. Intracellular signaling and cytokine induction upon interactions of Porphyromonas gingivalis fimbriae with pattern-recognition receptors. Immunol. Invest. 33: 157-172. Uehara, A., Y. Fujimoto, K. Fukase, H. Takada. 2007. Various human epithelial cells express functional Toll-like receptors, NOD1 and NOD2 to produce anti-microbial peptides, but not proinflammatory cytokines. Mol. Immunol. 44: 3100-3111. Krisanaprakornkit, S., J. R. Kimball, A. Weinberg, R. P. Darveau, B. W. Bainbridge, B. A. Dale. 2000. Inducible expression of human β-defensin 2 by Fusobacterium nucleatum in oral epithelial cells: multiple signaling pathways and role of commensal bacteria in innate immunity and the epithelial barrier. Infect. Immun. 68: 2907-2915. Harder, J., U. Meyer-Hoffert, L. M. Teran, L. Schwichtenberg, J. Bartels, S. Maune, J. M. Schroder. 2000. Mucoid Pseudomonas aeruginosa, TNF-α, and IL-1β, but not IL-6, induce human β-defensin-2 in respiratory epithelia. Am. J. Respir. Cell Mol. Biol. 22: 714-721. Liu, L., L. Wang, H. P. Jia, C. Zhao, H. H. Heng, B. C. Schutte, P. B. McCray, Jr, T. Ganz. 1998. Structure and mapping of the human β-defensin HBD-2 gene and its expression at sites of inflammation. Gene 222: 237-244.